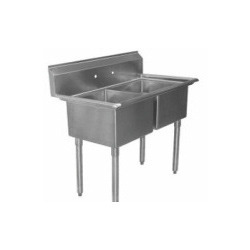 Utilizing the skills of our team, we are engaged in offering wide array of Kitchen Sink. Our product is manufactured by our professionals and experts in various sizes and designs. Customers can avail fine finish and quality approved product from us. Moreover, the offered product is highly demanded in the market for their rust free nature. Founded in the year 2001, Agarwal Crockery House has carved a niche amongst the trusted names in the market. The ownership type of our company is a sole proprietorship. The head office of our firm is located in Visakhapatnam, Andhra Pradesh. Leveraging the skills of our qualified team of professionals, we are instrumental in manufacturing a wide range of Kitchen Crockery, Plate Set, Crockery Unit and many more. Also, stringent quality checks are been carried out by us over the whole range, to assure that our products are flawless and are in compliance with the norms defined by the industry.